Sign the petition HERE in solidarity with the PC workers. Please see further down on the page for facts about the PC workers strike. The latest round of negotiations has failed. There have been three negotiation sessions in the last 11 days. The workers have offered to end the dharna if PC reinstates the PC-Four and continues negotiations on the other demands. The PC management has refused. There are now approximately 200 workers in the basement. Some of those who left briefly to go home were disallowed from returning. A few others continue to work their shifts and then return to the basement to continue their strike. Food is scarce. The PC has a staff of 550-600 people on daily wages. The management is hiring new people to cover the duties of the striking workers. Some say that workers from the Marriott Hotel across the street which the Hashwani Group also owns, have been brought over to cover duties at the PC. The Hashwanis are not budging from their position. However, the Human Resources Director as well as the General Manager appear to be softening on their stance, perhaps because they are worried about the increasing visibility of the strike. The police has so far not taken any action and even reportedly called it a “peaceful” demonstration, but workers fear that charge sheets have been drawn up for use in the future. The next round of talks is scheduled for 2pm on Wed, Mar 10, 2010. Please go to the PC Workers Occupation page for more details and facts about the strike. Initial negotiations failed, and the latest round is set for Monday, March 8 at 3pm at the Labor Department. During prior talks, the PC management demanded that the workers put an end to the dharna first before further discussions. PC also attempted to force approximately 60 workers to sign an agreement saying that they will not take part in the strike, and that if they should do so, the PC has the right to sack the workers. All of them refused to sign the agreement. The JUI (Jama’at-e-Ulema-e-Islam) has come out in favor of the workers. The party has issued an ultimatum that the PC re-instate the dismissed workers. The Karachi leadership of the JUI is also involved in negotiations with the PC management over this issue. We must ask: where o where are the secular parties? APP has, throughout, gone to great lengths to remind all and sundry that in Pakistan, too, there are workers and ruling classes, occupations and strikes, struggles and victories. Last week, 150 of these workers seized the basement of one of Karachi’s most iconic hotels, in protest at the targeted sacking of four trade union activists by management. This follows a sordid history of repression at their workplace; an ILO investigation concluded that “grave violations of union rights had been committed by the hotel management and local authorities.” All this is fitting, of course, for the fat cat under threat is one of Pakistan’s richest men. The Pearl Continental Karachi, occupied! A 9/11-induced downturn in business had provided a pretext for the hotel’s management to fire some three hundred workers. Four union activists–“the PC Four”–were targeted, around this time, on the trumped-up accusation of having started a fire in the hotel. 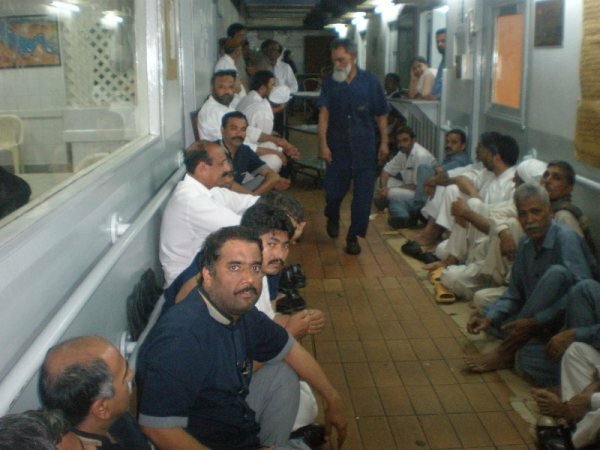 These workers were held in a secret Karachi prison for two months, before a court acquitted them of the charges–and produced, also, a ‘stay order’ on their dismissals (renewed, thrice, in 2006). Last month, however, these stay orders were canceled, and the workers summarily dismissed. In response, the PC Four, backed bravely by 150 of their colleagues, took control of the basement of the hotel. As of this morning, their occupation continues undeterred into its thirteenth day. The latest word was that management had suspended negotiations, absurdly demanding that the workers leave as a precondition for further talks. As is standard, these days, the mainstream media has observed a moratorium on coverage of the protest–one reporter from Express News got as far as collecting testimonies and editing a story, but his segment was barred from airing by his superiors. Lest it remain unsaid–this blackout exposes, again, the animated prattle about Pakistan’s ‘free media’ for the hogwash that it’s always been. They don’t dare offend the delicate sensibilities of their class allies. That’s our task. As a small corollary to the heroics of the occupying workers, a few of us have put together an online petition that we hope to circulate to our allies, home and abroad. Partly this is intended to shame the Hashwani Group, of course–and we will fax it to their head office once a respectable number have signed. This might even attract some media coverage, who knows. But above all, I think, the higher aspiration is to express our concrete solidarity with the workers, in the hope that the knowledge that other eyes are on their case will lift their spirits in what are surely trying times. Please sign, and spread the word about their struggle. Would that we were all this brave, I say. You are currently reading PC Workers’ Occupation at .